Alexei Malakhov/Streeter BURNED OUT: Firefighters look over destroyed building at 556 Yonge St. on Feb. 27 after having battled the blaze overnight. What was left of a sign seeking office and retail tenants hung from the front of 556 Yonge St., south of Wellesley Street, on the morning of Feb. 27. But there would be few takers that day or in the near future, as the vacant three-storey building had seemingly been destroyed overnight by fire. Alexei Malakhov/StreeterFOR LEASE: The former home of Freeman Formalwear, the building had been sitting vacant. Toronto firefighters got the call shortly before 11 p.m. the evening before, Deputy Fire Chief Jim Jessop told media on the scene that morning. By the early hours the blaze reached its height and was upgraded to a three-alarm fire, which means about eight pumping trucks and three aerial trucks (for spraying water from aerial ladders above) had been called in. About 50 firefighting staff were involved in bringing the blaze under control and keeping it from affecting neighbouring buildings. At the peak, flames were shooting from the top of the three-storey building. The building’s roof later collapsed, according to fire services. The 140-year-old building that caught fire was the former home of Freeman Formalwear. McDonalds at 552 Yonge St. and Galleria Express at 558 Yonge St. escaped damage. No injuries were reported. Nearby apartment dwellers however were forced to evacuate in the early hours when the fire risked spreading. Yonge Street was shut down immediately. 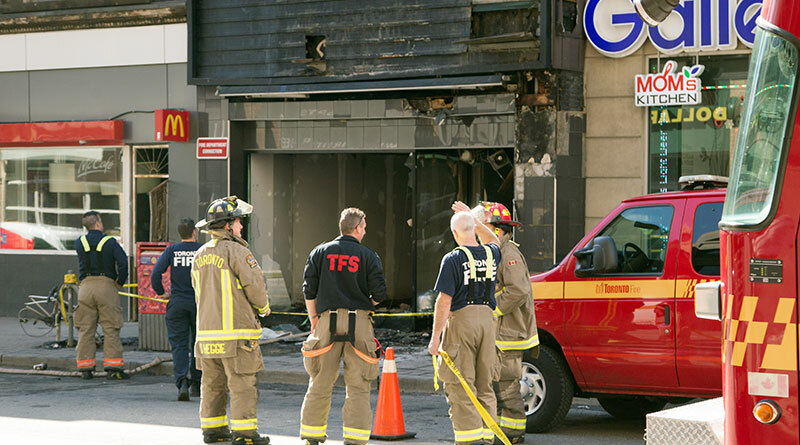 Toronto Fire investigators were on the scene the morning after the fire and they would be joined by the city’s building inspectors later to assess the structure’s safety, Jessop said. Alexei Malakhov/StreeterCLOSED: Police block Yonge Street traffic in both directions after the fire was put out, due to fears of a structural collapse.